BBC NEWS | UK | Magazine | What can't you send through the post? What can't you send through the post? 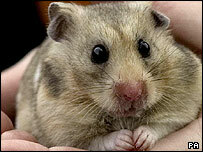 Two students who sent a hamster through the post as a drunken prank have been fined and banned from owning animals. So what else can't you put in a parcel? The hamster found in a postbox is now named First Class. And he's lucky to be alive. If he hadn't gnawed through the envelope and been spotted by the postman, he might have died in the sorting machine. David Jordan and James Cole, both 19, admitted abandoning the animal in circumstances likely to cause it unnecessary suffering. They were both fined and banned from keeping animals for 10 years. Not only were the two Cambridge University students committing a criminal offence, which they said they did when drunk and as an act of revenge, they were also breaking Royal Mail rules. So what else is banned from the postbox? Unlike other postal firms, Royal Mail does not ban the whole of the animal kingdom. A spokesman said: "Living creatures are prohibited but there are exceptions, like earthworms, bees and leeches. "But if you are going to send one, you need to seek advice from us on packaging because it needs to be acceptable. And you need to use first class post and clearly label the parcel." The RSPCA says these conditions are satisfactory and it has never received a complaint about them, although it advises people to use extreme caution in exercising them. Royal Mail also bans "filth", which is foul or disgusting material, and "indecent, obscene or offensive articles". Firearms are prohibited but sporting guns are permitted, with the necessary licensing and paperwork. Other items banned include loose batteries, loose Christmas crackers, alcoholic content above 70%, paint, matches and live plants (if to export). There is a general restriction on size of 1.5 metres in length and 20kg in weight. Human remains are banned, but what about living humans? James Abrams tested this loophole when he "posted" himself to 60 post offices around the UK to raise money for charity. Dressed like a parcel, he spent seven weeks being bundled into Royal Mail post vans and even on to motorbikes. Since 1 January, Royal Mail has faced competition in the postal market, so the rules can vary, depending on the postal firm. In practice, many of its new competitors, like Mail Plus and UK Mail, use Royal Mail in the final stages of delivery so apply the same rules. But some, like Intercity Communications, do their own hand deliveries. Julie Barnett, production manager, says there is a total ban on all live animals. "We don't allow any creatures at all, or any articles likely to cause injury or danger. Even sending bottles, which is not generally illegal but could be in circumstances where they might break and cut someone." Some items could break the rules if the packaging is see-through and offensive words or pictures are clearly visible, she added. If an offending item could constitute a criminal offence, as in the case of First Class, then the police are called. But if it only contravenes guidelines, then the regulator Postcomm is contacted for advice on how to proceed. So, I could save myself a heck of an air-fare if I just posted myself from Bedford to New York? I ordered some stick insects which arrived in the first class post. I don't recall that they were labelled in any particular way, they just came in a box. While it is not legal to post human remains, it is actually perfectly legal to post cremated remains. Only un-cremated remains are required to be posted via a courier. It is also legal to post live crickets! Just after freshers week last year some friends and I wished to test what stuff the post office would send if it was unwrapped or un-enveloped. We decided to send a t-shirt, a pair of (clean) underpants and a paper cup through the post with only an address sticker and a second class stamp on them. Everything came through fine except the t-shirt. We would be much obliged if it could be sent to the University of London if it is ever found. There's a song by the Velvet Underground called The Gift, about a man who sends himself by parcel to his girlfriend. Very funny song - very nasty ending! Surely James Abrams would have been heavier than 20kg (44pounds), not to mention a non-excluded "living creature" and therefore technically prohibited from being posted anyway.